Young adult romances and coming-of-age teen comedies, or various combinations thereof, have become white noise in recent years. Most follow a general template set forth by John Hughes thirty years ago and seek an appeal to their adolescent demographic. Films like The Perks of Being a Wallflower and This Spectacular Now present angsty characters and aggrandize their personal drama, while similarly structured franchises about troubled teens have rooted in popular YA novels. Intellectual property from authors J.K. Rowling, Suzanne Collins, Stephenie Meyer, James Dashner, and others does not demonstrate an overriding desire to reflect with glaring authenticity their teen audience’s everyday experiences. But then along comes The Edge of Seventeen, which reminds us what a distinct voice can do for a well-worn genre. Not to be confused with Edge of Seventeen from 1998, the debut from writer-director Kelly Fremon Craig pops onto the screen with all the energy and emotion of Hughes’ classics like The Breakfast Club and Ferris Bueller’s Day Off. 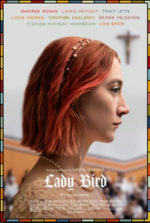 Alongside her producer James L. Brooks, Craig breathes life and immediacy into her brazen protagonist even as her writing embraces (and defies) some familiar clichés. She focuses on Nadine, played by Hailee Steinfeld, an overdramatic social misfit whose crisis throughout the film has a relatable, achingly genuine quality. But Craig also has a riotous sense of humor that has the viewer laughing more than most straight comedies. Written with all the fast-paced wit and ferocity of a Gilmore Girls episode, Craig’s film becomes and instant classic and a must-see for audiences just getting over their teens. 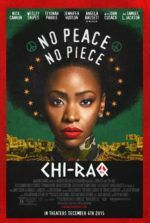 To be sure, Craig’s film earns its R-rating for foul language and some appropriately crude humor, albeit delivered with realism in the dialogue that captures how the millennial generation speaks. And given the rating, The Edge of Seventeen announces itself as uncompromising and willing to earn a little less from teen moviegoers in order to deliver a better, more realistic film. It also takes an honest look at Nadine, a determined outsider with a harsh word for nearly everyone and everything around her. Filled with self-loathing and self-deprecating humor, she grew up feeling like Number Two next to her older and much-celebrated older brother. Her flighty mother (Kyra Sedgewick) ignores her, while she’s a daddy’s girl to her considerate father (Eric Keenleyside), at least until his unexpected death. Fortunately, Nadine has Krista (Haley Lu Richardson), a lifelong best friend who remains so until, after a particularly wild night of teen drinking, Krista hooks up with Nadine’s popular, good-looking brother Darian (Blake Jenner). This sends Nadine into a downward spiral of solitude and cruelty toward her friend and brother, especially after it turns out Krista and Darian genuinely like each other. In a panic, she rushes in and interrupts the lunch hour of her history teacher, Mr. Bruner (a wonderfully dry Woody Harrelson), with whom she engages in snappy, often scathing banter carried out by two people who really enjoy each other’s company. Instead of sincere life advice, though, he offers inconvenient and sardonic observations, not to mention half of his cookie. Nadine’s predicament with Krista leaves her seeking attention from boys in a strain reminiscent of Sixteen Candles, albeit far more satisfying here. Although she pines after bad boy Nick (Alexander Calvert), her obvious choice should be the smart, awkward Erwin (Hayden Szeto), a talented and kindly classmate harboring an evident crush. Craig avoids making many of the mistakes Hughes made in Sixteen Candles, offering a far more satisfying conclusion through Nadine’s complicated, sometimes cringe-worthy journey. Luckily, in Craig’s hands, Nadine is not defined by the boy she ends up with; she remains a series of teenaged contradictions. In addition to her misanthropy and impatience for her own generation, Nadine also laughs a lot and has a biting sense of humor, even as she carries a weight of melancholy and sometimes punishing self-awareness. Steinfeld made her debut in Joel and Ethan Coen’s True Grit, delivering an Oscar-worthy performance that was followed up by several underwhelming turns into typical teen fare. She lives up to her promise here, delivering a strong-minded female character full of sharp-tongued wit and an overbearing confidence of words. There’s more gradation to Nadine, however; she’s a vulnerable, fragile narcissist and her own worst enemy. Steinfeld somehow makes her occasionally monstrous behavior comical, while Craig’s writing bears an earnestness not only when it comes to Nadine, but also the surprising layers that are peeled back on Darian, Erwin, Krista, and even Nadine’s widowed mother. Though not everything is wrapped up in a tidy bow by the end of The Edge of Seventeen, everything seems to end as it should. Craig’s directorial style is recessive; she seems to sit back and let her actors and the writing do the work. Of course, plenty of edgier, grittier films about teens have been released—everything from Rebel without a Cause to Fish Tank. What matters are not the familiar stories they tell, most of which involve emotionally strained parent-teen relationships and unfulfilled teen love. 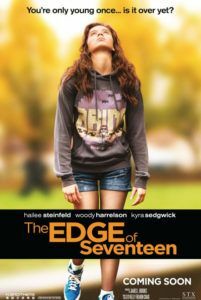 What makes The Edge of Seventeen something different is how Nadine learns to set aside her self-absorption in favor of the people she cares about. She finds acceptance and discovers her sense of self only by denying her innermost impulses. For this, Craig delivers a smart, funny, and occasionally heartrending story that surpasses many of the Hughes films we now call classics.